If you are passionate about your sports team and want to be the first to know every detail, then you’ll want to download the Team Stream HD app by Bleacher Report on your iPad. You can select your favorite teams and sports to create a custom news experience gathering sports-related content from across the internet and articles by sports reporters at bleacherreport.com. When you open the Team Stream HD iPad app you select your teams, or you can import teams from your Bleacher Report online account. To maximize your experience, you should activate notifications to remain constantly up to date on the latest and greatest successes or failures of your favorite teams. A neat inclusion is the ability to use location services to identify your favorite local teams. I don’t know whether to be impressed or chagrined by the algorithms used to identify my favorite local teams. I live just a couple of miles from the University of Kentucky, and the Team Stream HD iPad app gave me the opportunity to select both University of Louisville and University of Kentucky as local teams. There are some overly zealous fans of both teams in Kentucky who would have a serious problem with these suggestions. Another interesting inclusion to the selection process is the ability to follow a sport’s general news and fantasy news in addition to specific teams. Sports that do not incorporate teams are covered, and you can select tennis, golf, boxing, WWE and MMA. The Team Stream HD iPad app’s homescreen has a similar look to bleacherreport.com. Your custom news feed has the strong impact of a compelling photograph with a a headline. With a touch on the image, you are connected to the article in its original format online. If it’s an ESPN.com article, then you see it with the writer, images, and the full online ESPN.com experience. 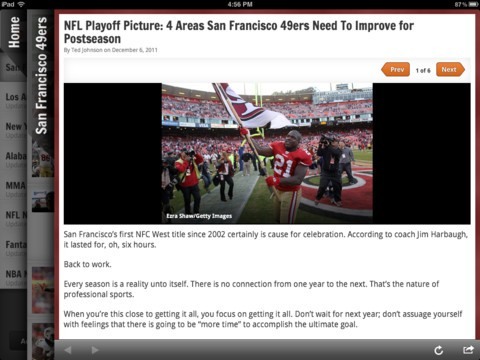 Team Stream HD’s iPad app frames the article and facilitates your sports news experience. If you want to share the article to your social networks and the appropriate button is included in the article, the Team Stream HD iPad app coordinates one-touch sharing. You simply authorize through the Team Stream HD iPad app. Or, you can use the share icon at the bottom of the screen to post to Facebook and Twitter, email a link, or send to Instapaper. A sliding menu bar provides one touch access to all of the latest news for your favorite teams. The menu bar and navigation through this team news is similar to Facebook and Twitter iPad apps. The list of teams and sports categories appear with an expanding menu on the left side of the screen. Your local teams are placed at the top of the list. You may add and edit teams from this menu as well. After you touch a team, another menu slides on the screen with a list of recent news containing a photo and its source. The Team Stream HD iPad app gathers tweets from notable sports writers, web articles from venerable online sources, bleacherreport.com articles, and relevant sports blog posts. When you select a news item, the article or piece of information appears in its original format and all of the same sharing options mentioned previously are incorporated. If you want to be the first to know and share your teams’ details, then the Team Stream HD iPad App by Bleacher Report is an absolute necessity. It’s quick, intuitive, and easily customized. AppSafari review of Team Stream HD was written by Jenni Ward on April 26th, 2012 and categorized under App Store, Free, iPad apps, News, Sports. Page viewed 4161 times, 1 so far today. Need help on using these apps? Please read the Help Page.